Following the stories I’ve included a link to the details of the images and how I chose these stories. Hoichi, a blind musician, lived in a monastery. In return for food and lodging he is required only to gratify the priest with a musical performance on certain evenings. He has a great talent for playing the biwa, a stringed instrument. One night he is summoned by a samurai to provide a musical performance for a high rank noble. Because one does not turn down the order of a samurai, he is led to a palace and performs as requested. He is told that he will be summoned every night for the next six nights to continue his performance. When the priest learns of this, he tells Hoichi that those whom he had entertained were ghosts from a nearby cemetery, and that he will be in great danger and come to a bad end if he returns again with the samurai. 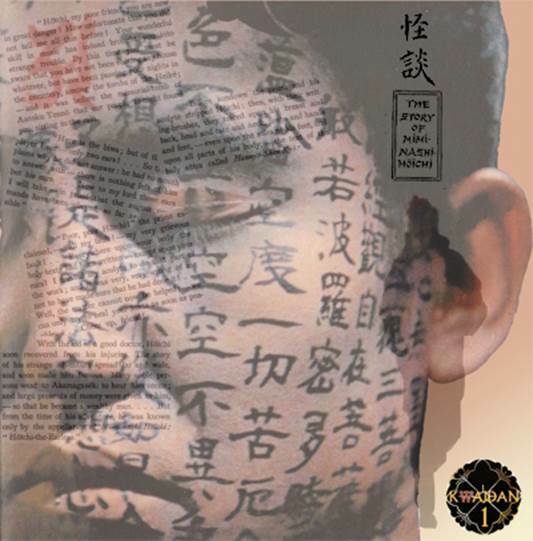 To protect him, the priest and an acolyte stripped Hoichi and with writing-brushes they traced on all part of his body the text of the holy sûtra Hannya-Shin-Kyō. However, when the samurai returns while he does not see Hoichi, he sees two ears — the acolyte failed to write the sûtra on Hoichi’s ears — and cuts them off and leaves. 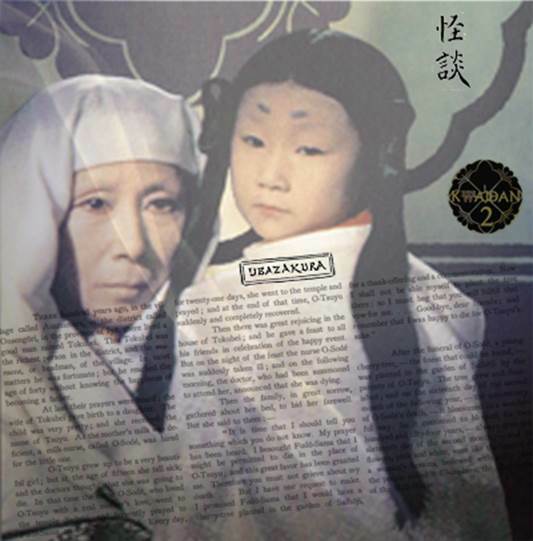 The priest returns and, with the aid of a good doctor, Hoichi soon recovers from his injuries. The story of his adventure results in many nobles who come to hear him play the biwa, and he becomes a wealthy man. But he is even better known because of the name he was given as a result of his adventure: Mimi-nashi-Hoichi: Hoichi the Earless. A rich man and his wife have been childless for many years. They address many prayers to the divinity Fudo-Myo-O, and finally they are blessed with a daughter, O-Tsuyu, a very pretty child. A milk-nurse, O-Sode, was hired to care for the little girl. At the age of fifteen O-Tsuyu fell sick, and her parents and nurse were told by the doctors that there was nothing that they could do, that O-Tsuyu was going to die. Every day for twenty-one days O-Sode, who loved O-Tsuyu with a mother’s love, prayed to Fudo-Sama; and at the end of that time O-Tsuyu suddenly recovered. On the following day, O-Sode suddenly fell ill, and the doctors said it was the affliction from which O-Tsuyu had suffered, and that O-Sode would certainly die. O-Sode told the family that she had made a bargain with Fudo-Sama to take her life instead of the girls’s. She requested only that the parents plant a cherry tree in the gardens of Saihoji. They did so, and the tree grew to be the most beautiful in the gardens. And the people called it Ubazakura, the Cherry Tree of the Milk-Nurse. Two woodcutters, Mosaku who was a very old man, and Minokichi who was his apprentice, a boy of eighteen years, were on their way home one very cold evening when a great snowstorm overtook them. They took refuge in a hut, thinking themselves lucky to find any shelter at all. They fastened the door, and lay down to rest with only their straw raincoats to keep them warm. The old man immediately fell asleep, but the boy lay awake a long time, listening to the awful wind, and the continual slashing of snow against the hut, and the roaring of the nearby river. He at last fell asleep, but soon awoke when he heard the door of the hut being forced open. By the snow light, he saw a woman in the room, a woman all in white. She was bending above the old man, blowing her cold breath upon him, freezing him. She turned to the boy and, instead of breathing her frozen breath upon him, she told him he would be spared, but that if he ever told anyone she would return and kill him, and the frightened boy so promised. Some years later a beautiful girl, O-Yuki, came to the boy’s village, and they fell in love and they had ten children and were very much in love. One night, after the children had gone to sleep, O-Yuki was sewing by the light of a paper lamp. She asked him to tell the tale, and he did, forgetting the promise he had made. With that, she disappeared, like a wisp of white smoke, up the chimney; never again did anyone see O-Yuki, The Woman of the Snow. If you enjoyed reading this story, please let me know! Authors thrive by the feedback they receive from readers. It's easy: just click on the email link at the bottom of this page to send me a message. 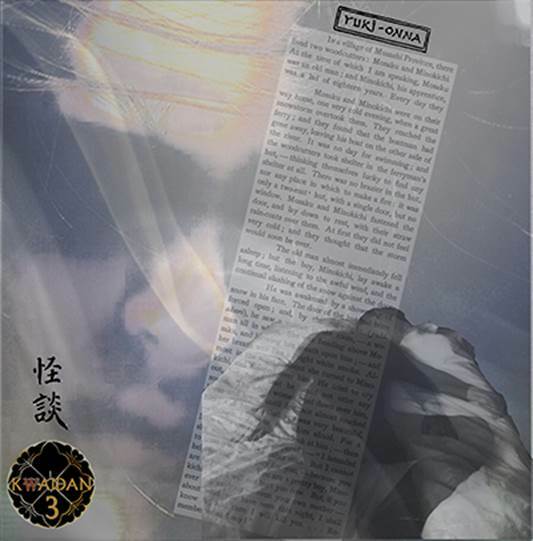 Say “Hi” and tell me what you think about ‘Kwaidan: Stories and Studies of Strange Things’. Thanks. I you would like to read about the images and what I used and how I created them, there is an annotated version of the story with the details here. This story and the included images are Copyright © 2008-2019 by Colin Kelly (colinian). The original image are copyright by original sources as indentified in the annotated version of this story. They cannot be reproduced without express written consent. Codey's World web site has written permission to publish this story. No other rights are granted.